I want to begin my remarks this morning with several words of thanks. As I do so, I acknowledge that such words are inadequate in expressing our sincere gratitude. And, I also acknowledge that there are many other people who deserve our thanks as well. First, thanks to our host church for this convention – Holy Cross Faith Memorial Episcopal Church. We are so very grateful for your many efforts in preparing for this time together and in exercising the gift of hospitality on our behalf. Therefore, on behalf of everyone here, thank you to the clergy, the staff, the vestry, and all the people of Holy Cross Faith Memorial! Also, thanks to the staff of our diocese and to the diocesan officers for your efforts all year long. Your work on our behalf is as tireless as it is impressive. That work also is not appropriately recognized. Thus, at this time, I do want to thank our staff and officers for all that you do for all of us. In addition, thanks to our visitors who enrich the experience of this convention. During the business session earlier, we recognized each of our visitors. However, at this time, I want to mention in particular our guests from Aberdeen, Scotland. Welcome, again, to the Rt. Rev. Robert Gillies and his wife Liz, who are close friends and colleagues to Annie and me. The Gillieses and all our visitors honor us by your presence, and we are grateful to each one of you for being here. Speaking of being honored, I am grateful and give thanks to God for Annie, my wife of forty-two years. Annie has been a source of encouragement and counsel all through these times. Together we have found ourselves in some unlikely and unexpected circumstances – including the one we discovered in retirement. Thanks, Annie, for your support and your love, on which I depend. Finally, thanks to all of you – in advance – for listening to these thoughts and reflections today. I hope that you will discover something of value in what I offer here. Our Prayer Book Catechism affirms that “The ministers of the Church are lay persons, bishops, priests, and deacons” (p.855). If you remember nothing else that I say this morning, please do remember that ministry is not exclusive to the clergy. Our church is a more full and more accurate personification of who it is called to be when all the people of God understand ourselves to be ministers. For the remainder of this Address, I want to reflect a bit on the subject of ministry and to offer several different perspectives on that subject. As I do so, please realize that I am speaking to and about all of us – every single one of us. Please also realize that I believe this subject to be extremely relevant to the life of The Episcopal Church in South Carolina. In fact, I have been humbled, over and over again, by the exercise of effective ministry in this diocese – ministry accomplished by laity and clergy alike. During my lifetime – before ordination and since – I have not witnessed ministry as effective and as faithful I have seen here in the past three years. We all are called to ministry. Along with those calls comes the empowerment to respond. Thus, calls to ministry come with gifts attached. St. Paul often wrote of gifts for ministry in his letters. To the church in Ephesus, he made this observation: “Each of us was given grace according to the measure of Christ’s gift…The gifts he gave were that some would be apostles, some prophets, some evangelists, some pastors and teachers, to equip the saints for the work of ministry, for building up the body of Christ, until all of us come to the unity of the faith and of the knowledge of the Son of God, to maturity, to the measure of the full stature of Christ” (4:7,11-13). Responding to a call to ministry necessarily includes the discovery of gifts. Such gifts come from God, and those gifts enable our response to God’s call. As you surely know, stewardship involves far more than only money. Indeed, we are stewards of all that God has given us. Some of you have heard my personal stewardship story before. However, I retell it here, in this context, with the hope that it will inform our understanding of the stewardship of all God’s gifts. When our younger son John was two and a half years old, Annie and I were told by a doctor that John required kidney surgery. That news certainly is something that no parent wants to hear. n the night before we travelled to Duke Hospital, I spent a good deal of time in our son’s room. As I looked at that small, innocent, sleeping child, the unfairness of the situation was hard for me to accept. I was upset at the circumstances in general. I was upset at God. And, I was even upset at myself, as the father who was supposed to protect this child. Now, thanks be to God, John came through surgery just fine, with no further complications. But I was changed by that night-time encounter. The gifts that I have been given – people, time, money, abilities – these, I know, are God’s gifts. I am a steward of those gifts for a while, and therefore, I have a certain responsibility for them. But the gifts themselves are God’s possessions. I therefore treat them with responsibility and with respect – at least, on my good days – but I do not claim them as owner. We are stewards – caretakers – of gifts from God. As we use those gifts in ministry, therefore, we do so as God’s stewards and for God’s sake – not for our own. As we use our gifts in the exercise of ministry, we fulfill two functions, and we act in two different roles as well. There may be other functions and roles involved, by the way, but there are at least these two. In the exercise of ministry, we act both as manager and as artist. My point here is that we use God’s gifts, as stewards, in the practical exercise of ministry. And we do so both as manager and as artist, if we do so in a full way. It seems to me that we who are called to ministry – clergy and lay – face the temptation from time to time to focus on one role and to neglect the other. It surely can be difficult to live into both these roles of manager and artist, but such a commitment is as essential for full ministry as it is difficult. The fact is that we can function as manager alone for a while. However, without attention to the artist within us, we may lose the soul and spirit of ministry. In this case, we run the risk of wearing ourselves out, as we try to do ministry. Further, we can function as artist alone for a while. However, without attention to the responsibility of manager, we may lose the ministry altogether. Here, we run the risk of becoming irrelevant to the world around us. Do you remember Jesus’ parable of the Sower (Mark 4)? Remember that the sower tossed seeds indiscriminately, on all kinds of soil. According to Jesus, some “seed fell on rocky ground where it did not have much soil” (4:5). Then, said Jesus, “it sprang up quickly, since it had no depth of soil. And when the sun rose, it was scorched; and since it had no root, it withered away” (4:5b-6). The ministry of manager or artist alone is like that seed on rocky ground. It may spring up quickly, but in the long run, it will wither away. We are called, though, to the full exercise of ministry – both as manager and as artist. That ministry is like seed falling on good soil. Like seeds sown in good soil, the exercise of ministry in its fullness will “(bring) forth grain, growing up and increasing and yielding thirty and sixty and a hundred-fold” (4:8). The sources of joy in ministry differ from vocations and professions which have tangible outcomes and visible results. We may have some of those, but such is not always the case in our ministries. Finding joy in ministry, therefore, often requires searching elsewhere than only for tangible results. This reality names a prominent cause of disillusionment among ministers – lay and clergy. The effects of good ministry often cannot be observed or measured after days or weeks or, even, after years. Thus, we must seek our joy elsewhere than only in immediate results. The fact is that joy in ministry comes from a variety of sources. However, one profound source of joy involves the conviction that we are partners with God in the flow of history – history which is, after all, in God’s hands. Jesus, of course, is the best indication and example that God finds human partners to seek and serve God’s will in God’s world. God came into history as a human being, in order to show the rest of us the trajectory of God’s will for the world. And we are invited to come along, as partners with Christ, for the sake of God’s will. ​Deep joy in ministry, therefore, involves more than a transitory sense of happiness and satisfaction, although there is nothing wrong with that. Deep joy, though, involves an intention and an awareness of partnership with the One who created all things. Such joy includes our grounding and being in union with Christ, as baptized brothers and sisters of Jesus. That awareness defines our ministry as people of God, and it touches joy at the depths of our soul. Such conviction also names the hope for our eternal glory. Therefore, I remember those of you who have told me that you’ve never worked this hard in church … and that you’ve also never had this much fun. I really do hope that continues. However, I hope and pray also that we continue to grow in awareness of the call to all of us, which comes from God. That call offers us gifts for ministry, of which we are stewards. By the grace of God, we live into our ministries both as manager and as artist. As we live and serve as partners with Christ, we find a joy which is as wide as God’s mercy and as deep as God’s love. 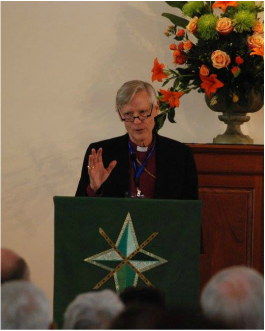 Thank you for all that you are and all that you do, as ministers in The Episcopal Church in South Carolina! The Bishop addresses delegates at Convention.